Tampa, FL (May 11, 2017): David Weekley Homes, the nation’s largest private home builder, hosted its fourth annual Spring Cleaning with Meaning clothing and supply drive, collecting 2,600 pounds of donations, as well as more than $700 in monetary donations. Clothing, shoes and household items were collected in the builder’s model homes during the month of April. Customers, homebuyers, vendors and team members within the company were encouraged to donate and the response was overwhelming. The Spring Cleaning with Meaning drive benefitted students of Mort Elementary School and Smith Middle School. 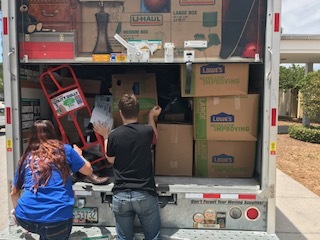 The annual drive is one of the initiatives of the company’s CARE program that joins team members with homeowners, homebuyers, community partners and local nonprofit organizations to live out its purpose of building dreams, enhancing lives in all of the communities in which it builds. Team members from David Weekley Homes load 2,600 pounds of clothing and household items collected for local children.